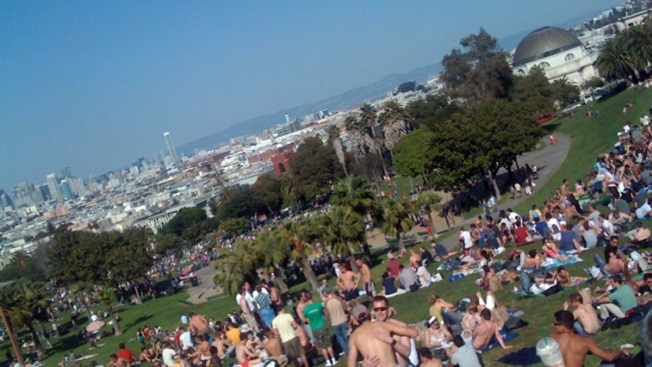 San Francisco’s Dolores Park, a giant and unique Mission District open space bathed in sunshine and hipsters, will partially close in the next two weeks, as the city begins a $12.4 million restoration slated to last more than a year. On Saturday, San Francisco Park and Recreation officials will break ground on the project, which will begin with the northern half of the park and last about 15 months. The city plans to rebuild the tennis and basketball courts, add an all-purpose recreational court and redo the park’s irrigation system. It will also install ADA accessible paths on the park’s vast lawns. But perhaps the biggest innovation will be to replace the park’s paltry three bathrooms with an armada of 35 commodes. But, alas, even progress has its peaks and valleys. For many of the park’s thousands of visitors, the long closure will come as an abrupt hiccup for the weekly social gatherings that draw hula-hoopers, jugglers and a fleet of food carts. Though the tennis courts will be closed down during the seven months of the first phase of the project, tennis instructor Kreg Kinnel was giddy about the renovation. Gilchrist said the fence around the north end, encompassing the area known as “Hipster Hill,” would go up around mid-March. After seven months the project would shift to the southern half of the park. The recently revamped children’s playground will stay open through the entire renovation. Gilchrist said the planning process took years and involved more than 50 community meetings. He said some in the community were fearful of the park changing too much. He said once the work is done, the park won’t look drastically different. But for the next year or so, visitors will have to make do with half the space.